Chris Barbour from Bate Design Strategies worked along side the Club to design the new layout. 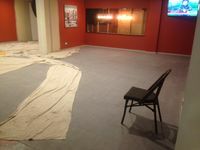 Farnham Developments started works in January and continues to assist the Morwell Club to ensure its operations run without too much disruption. Site Supervisor, Peter, is in the mean time enjoying the Club's lunch time menu. 28 March 2017 - Furniture has started to enter the new Cafe Area of the renovations. 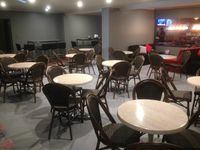 23 March 2017 - First photo is the view facing New Bar Area. It takes alot of patience from all the trades to work together. 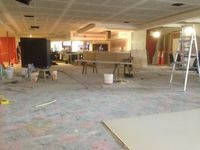 Simon Vella from Vella Cabinets created the Bar Joinery, Carpet Country Traralgon are laying the vinyl today and Michael Justice is, yet again, doing a great job of the tiling (second photo of tiling in the new cafe area). All seems to be going well for the end of April. Peter, our Site Supervisor, is still enjoying the food from the Morwell Club's lunch time menu. He is going to miss that side of things. March 2017 - The demolition of the old ceiling and installation of the new ceiling has come together well. Madeley Plastering and Blaby Electrical have yet again delivered a high end finish.